I knew I was splurging when I chose the Huagra Corral. 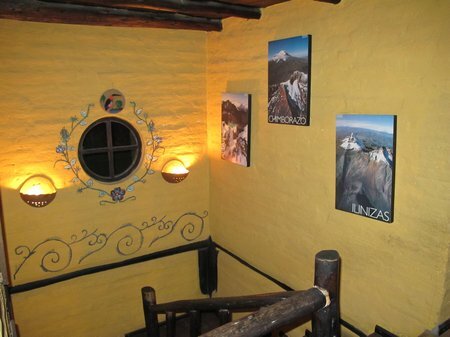 My thought was that it would be better to stay on the ground of the Cotopaxi National Park, to enjoy the peace and solitude – after being in Quito – than to stay at the nearest town (Latacunga) and have to get taxis or buses to and from the park. 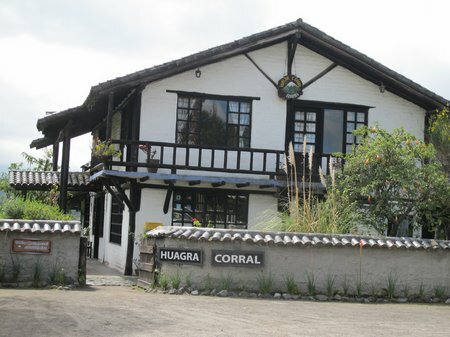 Our room at the Huagra Corral was small but charming. CAM + BigB loved the fact that we were on one “floor” and they were in the loft above us. Bathrooms were shared but are clean if small and a little quirky – the wooden shower doors were tricky to close. The entire hotel is beautifully decorated. The hosts, a young couple with a small child, were gracious and attentive. The cinnamon tea served before bed (even when we didn’t get back until late) was a really nice touch. 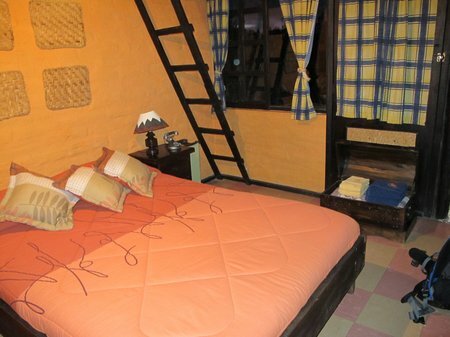 For $80 per room per night, breakfast – fruit juice, eggs, toast and cheese – was included. We did have a little issue with hot water – i.e. on our second morning there appeared to be none but after a word with the hosts, that was quickly resolved. We were the only guests of the hotel during our stay which meant we were able to make the most of the little sitting area on the same floor as our room. (In fact, this is where Murph and BigB discovered that the only pack of cards we had with us was not actually a full deck but rather a mismash of color cards from a variety of decks. So far that’s been our biggest packing faux pas). We really needed our long underwear while staying at the Huagra Corral. I’m sure the lack of central heating is not really noticable in the summer months, but if you’re visiting even in spring, I highly recommend packing some warm extra layers for nighttime. Finally, the directions to Huagra Corral by public transit are somewhat misleading. They state: “If you are coming by bus, you need to take the bus that is heading to Latacunga and ask the driver to leave you at the 44th Km or at the main entrance of The Cotopaxi National Park. After, you need to cross the Panamericana, and enter the Cotopaxi National Park. You need to walk 200 meters you will reach the destination.” That comment “you need to cross the Panamericana“, doesn’t prepare you for having to dash across a very busy highway with your bags or warn you that the minute you get out of the bus you may be swarmed by taxi/tour drivers pushing their services. Be warned! 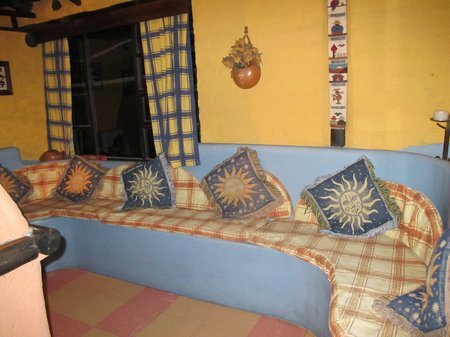 This entry was posted in Ecuador, International Escapades and tagged Accommodation, Cotopaxi, Ecuador, Huagra Corral Hostel on September 18, 2010 by wandermom.